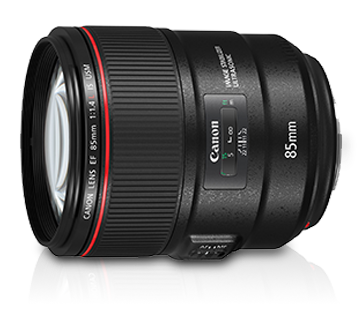 An 85mm standard focal length is a mainstay in any portrait photographer’s arsenal, and this L-series member of Canon’s popular 85mm prime lens lineup features up to 4 stops image stabilisation, a large, bright f/1.4 aperture, high-speed AF and advanced optical technology, all within a compact, lightweight body—perfect for shake-free handheld portraits with high image quality. The lens construction includes 1 molded glass aspheric lens element to correct spherical aberration and curvature of field for a clear image all the way to the image peripheries, and Air Sphere Coating (ASC) to prevent ghosting and flaring, resulting in beautiful, high-quality depictions regardless of scene. Dust-proof, water-resistant and resilient, this lens is also perfectly capable of enduring extreme environmental conditions as well as rough handling.